Smartphone using Android and WP7 or iOS have built in QR code reader or Decoder app for free. Reading QR code or a Bar code is now not just a fun but it has many use now a days. You don't have to type the information associated with the advertise, address, URL or anything. Just scan the code and you are done. You also can generate QR code for anything like your text, mobile number, image, URL and anything you want. Read this article for generating QR code for free and easy. Just do it and you have archived the item forever. You just follow the code and get all the information. But what if you don't have the Smartphone? Dont worry, do you have WebCam on your computer? Then its fine. 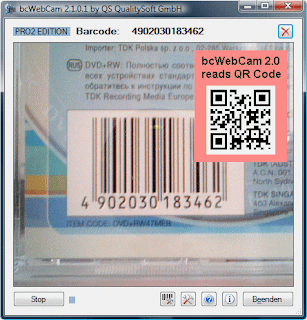 You can use that webcam as QR code scanner and reader. Simply hold the webcam before the QR code and with "bcWebCam 2.1" -a QR code reader software- the camera reads from the bar code on and automatically copies the content in your browser, your notebook or any other applications. Its so simple to use. Just start the application, hold your code in front of camera and click on the code you see in your screen. This is free and simple application works with Windows. Download it from its Homepage HERE.